Acute rheumatic fever is an inflammatory autoimmune disease that occurs 2 to 6 weeks following an untreated or undertreated group A beta-hemolytic streptococcal infection. It affects the heart, joints, central nervous system (CNS), and skin. It is prevented by prompt treatment of the infection through a prophylaxis of antibiotics within 9 days of onset of streptococcal infection before further complications can develop. Because rheumatic heart disease does not occur after only one attack and children are susceptible to recurrent attacks of rheumatic fever, it is vital that an initial episode is diagnosed and treated, and that long-term prophylactic therapy (5 years or more) is given following the acute phase. The signs and symptoms of rheumatic fever are classified into major manifestations (polyarthritis, carditis, chorea, subcutaneous nodules, and erythema marginatum) and minor manifestations (fever, arthralgia, ECG and laboratory changes) according to the revised Jones criteria. The diagnosis is based upon the presence of 2 major manifestations, or 1 major and 2 minor manifestations, supported by evidence of a preceding group a streptococcal infection is indicative of acute rheumatic fever. 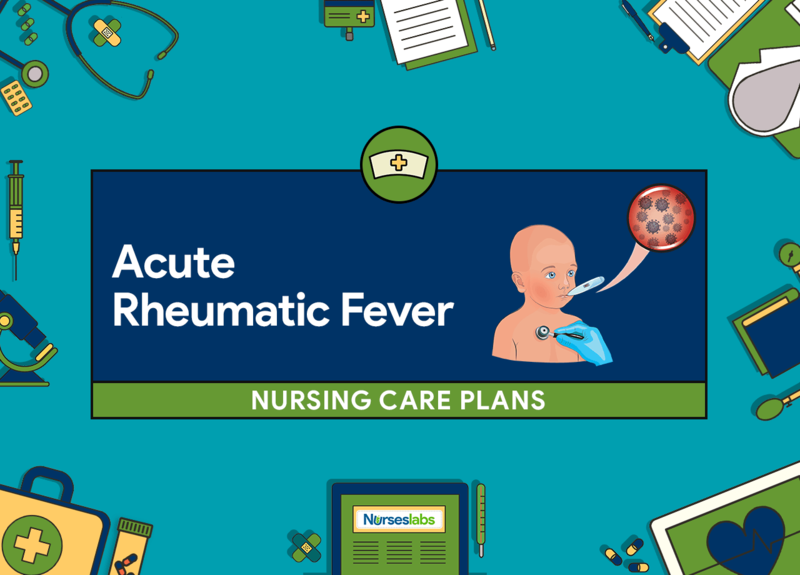 Nursing care planning goals for a child with acute rheumatic fever include reducing pain, conserving energy, promoting activity tolerance, and providing education about the disease, treatment and preventive measures needed to avoid recurrence and possible complications. Child will verbalize less pain by using a scale of 1 to 10. Child will appear relaxed without guarding. Child’s joints will not become inflamed, red, or warm. Assess the child’s pain perception using an appropriate scale every 2 to 3 hours. Provides information about the pain level of the child. Assess changes in behavior, such as high-pitched cry, irritability, restlessness, refusal to move, facial grimace, aggressive or dependent behavior. Nonverbal pain descriptions that are age-related as child or infant may be unable to describe pain; fear and anxiety associated with pain cause changes in behavioral responses. Examine affected joints, degree of joint pain, level of joint movement. Provides data about pathologic changes in joints; reversible joint involvement usually affecting large joints, such as knees, hips, wrists, and elbows; an increase in numbers of affected joints occurs over a period of time. action analgesic before bedtime or 1 hour before anticipated movement. Relieves pain, inflammation in joints and provide rest and comfort. Elevate involved extremities above heart level. Improves circulation to the heart to alleviate edema. of the disease. Promotes relief of joint pain caused by movement. Advise positional changes every 2 hours while maintaining body alignment. Prevents contractures and promotes comfort. over painful joints. Avoids pressure on painful parts. Assist in gentle handling and supporting of body parts. Prevents extra pain to affected parts. Provide toys, games for quiet, sedentary play. Provides diversionary activity to distract from the pain. Encourage the use of nonpharmacologic interventions such as imagery, relaxation, distraction, cutaneous stimulation, heat application. Provides additional measures to decrease pain perception. Stress the importance of limited activity or amount of joint movement allowed. Prevents increase or exacerbation of pain. Teach parents and child of the need for analgesia and that it will help him/her to feel better. Controls pain, and allows for uninterrupted sleep and activity within the tolerance level. Reassure parents and child that joint involvement is temporary, that pain and edema will subside, and that joints will return to normal size. Reduces anxiety related to fear of irreversible damage. Educate parents in proper body positioning and handling of affected parts. Promotes comfort and avoids pain and contractures during bed rest. Hyperthermia: Body temperature elevated above normal range. Child will demonstrate temperature within the normal range and be free of chills. Assess temperature, heart rate, and blood pressure frequently. A temperature of 101°F (38.3°C) or above is noted along with redness, pain, and swelling of the joints; HR and BP increase as hyperthermia progresses. Administer nonsteroidal anti-inflammatory drug (NSAIDs) as prescribed; Observe for any untoward effects of NSAIDs. Reduces inflammation and pain; Side effects of NSAIDs may include abdominal pain, tinnitus, dizziness, headache, stomach ulcer, GI bleeding. Administer a course of penicillin therapy or a single intramuscular dose of benzathine penicillin. A complete antibiotic treatment of penicillin eliminates group A streptococcus infection. Provide a tepid sponge bath. Helps reduce the occurrence of fever. Modify the child’s environment such as room temperature and bed linens as indicated. Room temperature may be accustomed to near normal body temperature and blankets and linens may be adjusted as indicated to regulate the temperature of the client. Eliminate excess clothing and covers. Exposing skin to room air decreases warmth and increases evaporative cooling. Maintain bed rest especially during the acute febrile phase. Conserves energy and reduces metabolic rate. Teach child and family members about the signs and symptoms of hyperthermia and help in identifying factors related to the occurrence of fever; discuss the importance of increased fluid intake to avoid dehydration. Providing health teachings to the patient and family aids in coping with disease condition and could help prevent further complications of hyperthermia. Child can work within the limits of tolerance for that perfectly measured. Assess the child’s mobility and physical activity level. Provides baseline information for formulating nursing goals during goal setting. Assess and evaluate nutritional health status of the client. Adequate energy reserves are needed during activity. Monitor pulse rate, blood pressure; observe for dyspnea, use of accessory muscles, and skin color before and after activity. Identifies the cardiopulmonary status of the client needed to help determine the ability to tolerate an activity. Provide emotional support and positive attitude regarding abilities. Appropriate supervision during early efforts can enhance confidence. Encourage adequate rest periods in between activity. Allows optimal performance during n activity. Assist with activities of daily living as needed such as eating, bathing, dressing, elimination. Decreases oxygen consumption and boosts confidence in performing a task. Encourage and teach the child with active range-of-motion exercises. Helps improve joint function and prevent muscle atrophy. Instruct child to resume activity gradually once asymptomatic at rest and indicators of acute inflammation have resolved. Help pace the child’s energy and provide for maximum comfort. Risk for Infection: At increased risk for being invaded by pathogenic organisms. Child will experience an absence of occurrence of reinfection. Child will be afebrile; no complaints of discomfort. Child will take medications as ordered. Assess parents’ knowledge and skills in the administration of prescribed antimicrobials; daily oral administration or monthly intramuscular injections. Providing long-term antibiotic therapy (as long as 5 years) as a preventive measure may be challenging. Monitor for chest pain, shortness of breath, fatigue, cough, night sweats, friction rub, gallop during the acute stage of the disease. Signs and symptoms of carditis, which may result in endocarditis causing vegetation that becomes fibrous at the valve areas that is at increased risk of recurrent infections. Administer antibiotic therapy during the acute phase of disease as prescribed. Inhibits cell wall synthesis of microorganisms, destroying the causative pathogen. Instruct in the long-term antibiotic regimen, the need for protection prior dental work or any invasive procedure, and inform of importance to prevent recurrence. Therapy begins after the acute phase and medical supervision is needed for life as rheumatic fever may recur; a high percentage of children who incur the disease have cardiac complications later in life. Notify the physician immediately for any upper respiratory infections, elevated temperature, joint pain, or non-compliance to antibiotic therapy. May indicate recurrence of the disease or need to change or adjust medication.